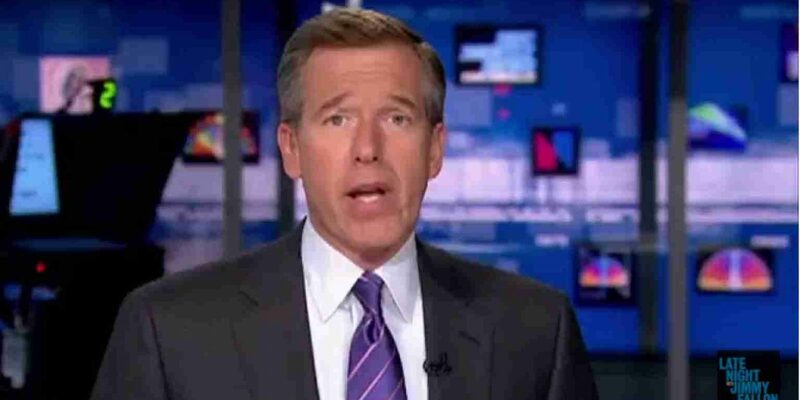 INSANITY: Brian Williams Calls Trump's Air Strikes "Beautiful"
In a moment that might be the end of Williams sordid, sorry career, he praised the video released by the Pentagon showing a U.S. destroyer launching a missile into the night sky. Williams then loosely quoted the late poet/musician Cohen’s work “First We Take Manhattan,” “I’m guided by the beauty of our weapons.”, “I’m guided by the beauty of our weapons,” he said. Adding, “And they are beautiful pictures of fearsome armaments making what is for them a brief flight over this airfield what do you think they hit?” Williams asked. First we take Manhattan, then we take Berlin,” the lyrics said. There is nothing "beautiful" about war. Hell only exists because humans keep creating it. You'd think a guy who had experienced the horrors of a missile attack like Brian Williams wouldn't be so enthralled by a missile attack. Williams was previously involved in a scandal in which he lied to the American people on air that he was in a helicopter in Iraq that was shot by an RPG and AK47. Williams was called out by a soldier Lance Reynolds on Facebook who was aboard that aircraft who denied his presence at the scene. Williams then apologized stating he made a mistake that he was in the following aircraft after pushing his story as war propaganda he was later fired from NBC and hired at MSNBC. You would think that someone who had a rocket shot at him would know the horrors of war but apparently, Williams thinks that missiles in the sky about to kill people and cause destruction are a “beautiful” thing, maybe he should volunteer to go cover it up close and personal in Syria as a foreign war correspondent?